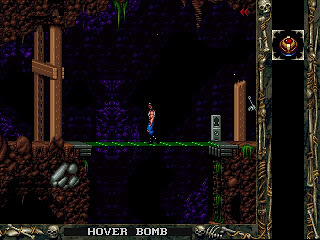 BlackThorne was developed by Blizzard and published by Interplay in 1994. 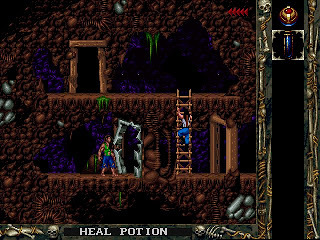 BlackThornse uses a very weird 256-color 320x240 graphics mode instead of usual 320x200. 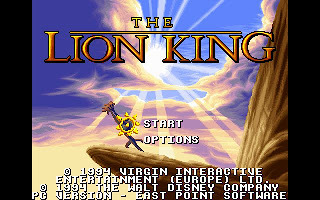 As the game was released in 1994, it of course works well with major soundcards. 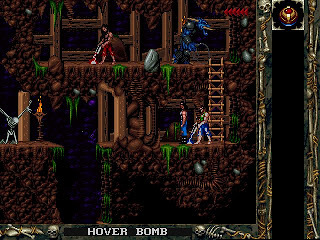 All Blizzard games was well polished, and BlackThorne is with no exception. The graphics is nicely designed and very clean. Clean in the sense that we can hardly spot any pixel run out of place or detect a visible edge of the animation. Blackthorne is set on the planet Tuul, which has existed for hundreds of years without human knowledge. All of this time, Tuul's people have been ruled over by a single shaman who "was blessed with all knowledge". Years before the game begins, Thoros, the latest ruler, finds it near impossible to choose between his two sons as the next ruler. 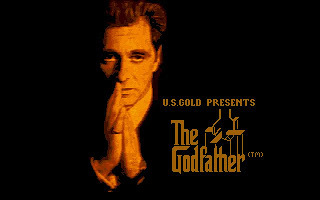 Believing it will solve the dilemma, he leads them to the deserts and kills himself. His body becomes two stones, light and dark, and he gives one to each boy to rule their own kingdoms respectively. The people of the lightstone form the kingdom of Androth, and the people of the darkstone form Ka'dra'suul. But while Androth respects their stone, Ka'dra'suul reject theirs, and are eventually transformed into monsters by it. In this time, a ka'dra named Sarlac seizes power. He forms an army and leads them against Androth. Knowing of his people's doom, the ruler of Androth, King Vlaros, with the aid of the Androth magician Galadril, sends his son Kyle to Earth to save his life. Vlaros also gives Kyle the lightstone for safe keeping. He wishes that Kyle can one day return and use it to save their people. 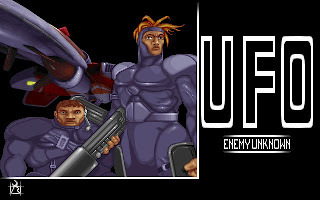 20 years later, Kyle has become a renowned military captain and mercenary. After breaking out of prison facing court martial, Kyle begins having strange dreams, and eventually is reconfronted by Galadril. He is told that it is time to return to Tuul and save his people. 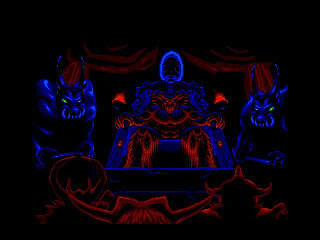 The game begins here with Kyle setting out to kill Sarlac and reclaim his throne. 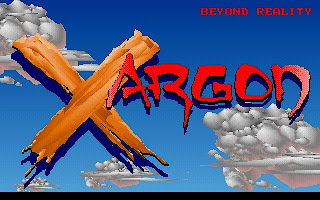 The game focuses around Kyle Vlaros who is known as the Blackthorne, out for revenge on Sarlac and his minions. 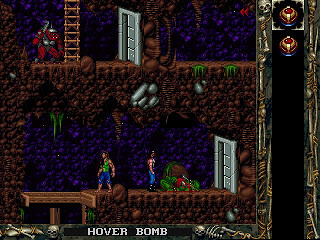 The gameplay involves large platforming sequences similar to the Flashback, in which we can run and climb around the environment, find keys and items and progress to the end of each maze like level. 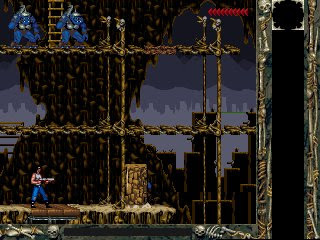 Combat in Blackthorne takes the form of gunfights. The unique feature in these moments is the ability to prone the wall and dodge incoming bullets. This can make for some interesting gunfights, but can also be hard to beginner players not used to the controls. The game has seventeen levels within four areas - the mines of Androth, the Karrellian forests/swamps, the Wasteland desert, and Shadow keep. As the game progresses through these areas, we become stronger and better armed, but so do the enemies. 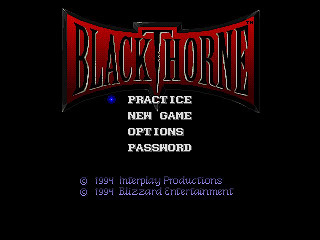 You can download BlackThorne here. The full manual is included in the package.